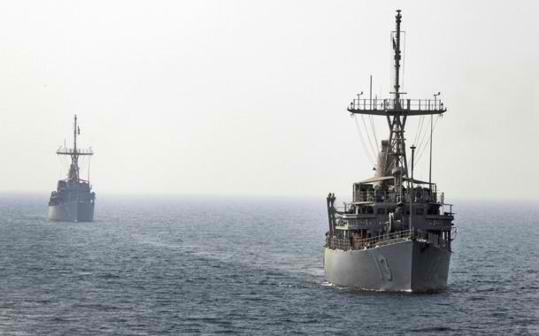 Western powers and several of their Middle East allies have deployed an enormous naval fleet to the Persian Gulf just days after Israeli Prime Minister Benjamin Netanyahu again suggested that his country may soon launch a preemptive strike against Iran's nuclear facilities. The fleet includes ships from 25 nations, include three full US carrier groups, each one with a compliment of more aircraft than the entire Iranian air force. Military officials cited by London's Daily Telegraph said the buildup is part of a new annual exercise, but their was no secrecy about the fact that the "enemy" in the exercise is Iran. There is great fear among Western powers that if Israel strikes Iran's defiant nuclear program, the Islamic Republic will retaliate by trying to close the Straits of Hormuz, a narrow waterway in the Persian Gulf that sees the daily transit of 18 million barrels of oil, or roughly 35 percent of the world's traded oil. For that oil tap to be shut off would have potentially catastrophic consequences for the economies of the US, Britain, the Euro Zone and Japan, among others. There is also great concern that Israel is planning to strike Iran before the US presidential election in November in order to force President Barack Obama to militarily support the effort. Obama would likely lose a lot of votes among the pro-Israel American public if he did not help, and Jerusalem is worried that if it waits until after the election and Obama wins, he will be less inclined to provide assistance. American and European officials have conducted a flurry of meetings with Netanyahu and Israeli Defense Minister Ehud Barak over the past month, ostensibly to pressure Israel against using military force at this time. Obama and other Western leaders continue to insist that there is hope for a diplomatic solution, despite recent reports by the International Atomic Energy Agency (IAEA) suggesting that the past 10 years of diplomatic efforts have only served to accelerate Iran's nuclear program. "The world tells Israel 'Wait, there’s still time.’ And I say, 'Wait for what? Wait until when?’," Netanyahu said last week. "Those in the international community who refuse to put red lines before Iran don’t have a moral right to place a red light before Israel." Netanyahu reiterated the urgency of the situation in a series of interviews with the American press over the weekend. Asked on NBC's Meet the Press program about the possibility of implementing a containment strategy as was done with the Soviet Union after it went nuclear, Netanyahu said the West was underestimating the fanaticism that rules Iran. "I think Iran is very different, they put their zealotry above survival... I wouldn't rely on their rationality," said the Israeli leader. "It's the same fanaticism that you see storming your embassies today. You want these fanatics to have nuclear weapons?"